Banda Aceh in Aceh province is collaborating with The Jakarta Post in a bid to boost and expand promotion efforts in the investment sector and tourism. During a visit to the Post in Jakarta on Thursday, Banda Aceh Mayor Aminullah Usman said the biggest challenge the city administration faced was attracting investors. “The vision of our administration is Banda Aceh Gemilang dalam Bingkai Syariah [Glorious Banda Aceh in the Frame of Sharia] with its three development pillars, namely religion, economy and education,” the former president director of Bank Aceh, who has been a mayor for just over one year, said as quoted by bandaacehkota.go.id. “Particularly for the economic sector, we need support from all parties. The regency budget [APBK] of Banda Aceh is only Rp 1.3 trillion [US$92.2 million], which is of course not enough. One of the solutions is to lobby investors from inside and outside the country to invest,” said Aminullah. Investment potentials in the city are huge, Aminullah said, such as hotels and modern shopping centers. Regarding investment permits, Aminullah said that the issuance process would be eased. Aminullah added that Islamic tourism in Banda Aceh offered traditional gems that no other region had, such as Baiturrahman Grand Mosque, zikir akbar (large-scale religious chants), a three-month celebration of Maulid Nabi Muhammad (commemoration of the Prophet Muhammad’s birthday), unique activities during the holy month of Ramadhan and many other religious events. 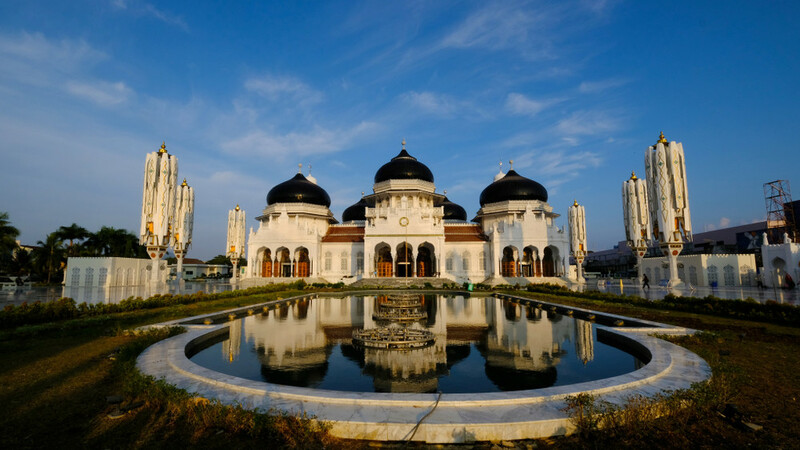 Aside from religious tourism, Banda Aceh is also famous for its historical tourist sites, art and culture, cuisine and coffee. “Banda Aceh has Putroe Phang Park, Gunongan, Peucut Kerkhof, the BI Building, as well as tsunami educational tourist sites like the Aceh Tsunami Museum, PLTD Apung [floating diesel-fueled power plant] and Kapal di Atas Rumah [Boat on a House],” Aminullah continued. The region is also home to pilgrimage sites like the tombs of Sultan Iskandar Muda and Islamic scholar Syiah Kuala. “Banda Aceh also has a river walk area that we continue to develop alongside the heritage Krueng Aceh and Krueng Daroy rivers, as well as Ulee Lheue Beach that faces the Indian Ocean,” Aminullah said. During the meeting, The Jakarta Post editor in chief Nezar Patria said that Banda Aceh indeed had huge potential that should be promoted to the world. “We believe that the image of Aceh as a place that implements sharia does not represent the entire picture of the province,” said Nezar, who is from Aceh. Nezar said that among the strengths of Aceh is its long-time proven diversity and tolerance.